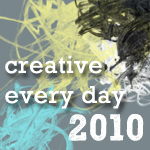 Ways to share: Once you've signed up, you can leave a comment on this post and/or use the "Mr. Linky" widget below to link to a blog post(s) about your creative activities during the days of 9/6/10 - 9/12/10. Theme: The (totally optional) theme for September is the element of Water. I'll be posting about the theme throughout the month and you can feel free to use it to inspire your creations, follow your own muse, or do some combination. You can find out more about this month's theme and some prompts to get you started with September's theme here. I didn’t write about water this week, but I did write from my heart. A sunset, some leaves, a still life, and a thunderstorm last week. Lots of creative stuff going on for me! See my first post over at Mortal Muses on Wednesday – there will be some WATER involved! as much as i enjoyed summer, i am so ready for fall! i feel like fall is a bit of a creative fire for me… i move so slowly in the heat but as it starts to cool down, i leap into creative action. i love this time of year. It’s nice to pay homage to “water” this month. I like to work with watercolor and that medium is “all about the water”…which is what I titled today’s posting. I get to look at it from two directions: water as it influences medium; water as something to draw. Fun! Water, hmmm… maybe a Venice painting is in order for this month. All systems down with my body for the past week. Managed a little creativity from a recent Art Craze Day with my Mom and sister. I have a few ideas for the water theme, but unsure if they will materialize. Happy CED everyone . Water… hum. As I usually do many paintings and take many photographs of the sea, I surprised myself and went to the heart of our island and took photos of the first leaves on the road and basically spent some time catching fall. Next week maybe will see me spending more time with water… it is raining outside though:) Thank you Leah and happy fall to everyone. I’m feeling very calm & centred for a change and the theme of water has already seemed to fit in with this mood. So far I’ve painted a sea inspired canvas & spent time painting seaside pictures with my daughter. Over on my blog I have also interviewed writer Shanta Everington & I have found her answers inspirational. I’ve turned back to my Storm at Sea quilt, in keeping with this month’s theme. “Morning After the Storm” was inspired by a pale pastels batik; some sea creatures begged to be trapunto’d onto the larger “square within square” blocks. Thinking of a paper-pieced sun-rays border around this one; please comment if you’d like and give advice! Water… The tears I cried after an argument with my daughter last week. The pool I floated in, with my friend, over the Labor Day weekend. The rain that fell on my friends and I one evening as darkness fell. The wonderful Thunder and Lightning storm that blew through this morning. Water is in us, on us and around us always. A slippery cocoon that slides us though this life and an essence we can’t do without. Losing some momentum as I plan 3 short vacation over the next month, tee hee! But at least work is finally slowing down, so I should have a more freely creative mind & more free time very soon. “Water” theme, oops… does it count if I say that garlic makes me thirsty? HA! found some inspiration at the beach.. I brought my art supplies with me on my trip and sketched.. it was a serene moment for me, a reflective time to do what I love in a place that I can’t get enough of, the beach, the water and beautiful sunrises. inspiration is all around. thanks! I haven’t been creative this week at all. Unfortunately, my MS has taken all my attention again, so I’ve posted old stuff on my blog. Trying to get out of this painful rut. I always manage to see my way clear and carry on, but it seems to be taking longer this time.